For over a decade, UpOnline has helped dentists strengthen patient relationships and expand their online marketing presence, while guiding them through an ever-changing online landscape. UpOnline's integrated solutions provide all you need to drive traffic to your website, generate more appointments, and keep you top-of-mind with patients. We pride ourselves on taking a personalized approach to your online presence marketing. We offer customized service plans tailored to your unique needs. Click on a service below to learn more and view our packages to find a solution that is perfect for you. 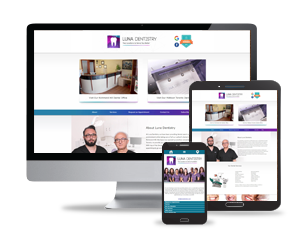 A website is an important first impression tool for potential patients to learn about your office and a vital part of growing your dental practice. With over ten years of experience in Dental Marketing, UpOnline knows what drives patient appointment requests, how to best communicate services and provide an easy-to-navigate website which reflects their experience in your office and increases patient engagement. UpOnline's experienced team works with you to create a website that promotes your services, your team, and the quality services your practice provides. Every site we build is custom, we do not use cookie-cutter templates. Our websites are clear, concise and informative. Whether you define yourself as a family practice, specialize in cosmetic services, restorative procedures, and how you cater to families and anxious patients. UpOnline will create a website that is user friendly, visually appealing, and most importantly, act as an online extension of your office. Take advantage of our years of experience in web design aimed at helping practices like yours. We employ Search Engine Optimization (SEO) best practices to ensure reliable results. Research is done to optimize your website based on location, service, and industry specific keywords and phrases that potential patients use to find services like yours. Clients are provided ranking reports on an ongoing basis. For those potential patients we can't reach effectively through organic SEO techniques. UpOnline also helps practices through paid search marketing. Search engine strategy built for your practice's long-term success. Google and other search engines often update their search algorithms; UpOnline's SEO techniques evolve regularly and updates are made periodically to continue achieving top page results for competitive keywords. Our proprietary dental SEO process includes enhancing on-site factors such as your website content, the structure of the website, cleanliness of the HTML, loading speed, and other variables through white-hat best practice techniques only. And importantly, we work to improve off-site factors like your social reputation and the number of websites that link to you, which helps build online trust. This combination of on-site and off-site SEO will quickly improve the rankings of your practice's website. UpOnline makes it very easy for satisfied patients to write positives reviews for you online. Collect new positive reviews quickly and easily with UpOnline's timely feedback requests. By engaging with patients at critical moments and making it easy to write a review, you can capture feedback from all patients, including satisfied ones not typically active online. More positive reviews = more conversions, higher ratings, and more patients. Track all your reviews from across the web and respond in real-time to customer complaints before they escalate. See the big picture of your ratings and reviews with customized reports. Google AdWords will help you strengthen brand awareness, grow website traffic, and bring new patients to your practice. Google Adwords and other search and social media advertising is highly targeted and trackable. UpOnline leverages targeted pay-per-click, search engine, social, display, and re-targeting advertising to help reach your target patient at the point in time they are interested in your services. Online advertising is an incredibly powerful medium. When most people think of online advertising, they think of banner ads but there are many more options available. While banner ads or display advertising are a part of online advertising, there are many more options. We leverage finely targeted pay-per-click, search engine, social, display, and re-targeting advertising to help reach your target patient at the moment they are most interested in your services. People use social media daily to connect with friends and companies. Your patients and potential patients are spending more and more of their time online. Help represent your practice online! UpOnline produces monthly update reports and in depth quarterly reports as well. Gain knowledge from the entire dental industry through our annual patient satisfaction survey where we look at your patients understanding of your services, their likelihood to recommend your practice - and most importantly - what drives overall satisfaction for dental patients. UpOnline clients also receive reports to help them better understand and gauge the effectiveness of their marketing programs. We provide an exhaustive overview with insights on patient messaging, website analytics, SEO ranking, and newsletter campaign effectiveness. As part of the iterative process, the reports help guide the necessary adjustments to maximize results over time. Would you like the best website in your market? Our team will put together a free analysis that shows how your website stacks up against other dental practices in your area for a variety of important factors. We will also analyze your existing website traffic to help you understand where you are doing well and where you can improve. We will also develop an action plan on how we can improve your website with tips on simple changes you can do to generate more new patient leads.